Sarah Eden has a talent for making her characters come to life. Ashes on the Moor is no different. Right from the beginning, I was drawn into the story. This was one of those books that I really didn't want to put down, and had to force myself to stop reading each night so I could go to bed and not be a complete mombie in the morning. Evangeline suffers one heartache after another, and it seems the blows just keep on coming. She is thrown into a world that she knows nothing about and is left to fend for herself. We get to see some of her fire then, when she doesn't give up and does her best to learn how to survive in this strange new world. I enjoyed seeing her true self come out when she was teaching the children. Dermot is an interesting character. I think the description "quarrelsome ol' dog" fits him perfectly...at first. But as he gets to know Evangeline better, he lets his guard down and we get to see what he's really like. I enjoyed watching all of the relationships in the story progress. Each character brought something to the story and I feel like we got to know them all just as well as we would have if we were living there with them. This is definitely a book that will be read again. I love Sarah M. Eden's books. They do not disappoint, and even when she strays from her typical genre, they're still enjoyable. One of my favorite aspects to Eden's books is that you can always count on her to write good, clean fiction. That, and she's so good at developing her characters. There is so much emotion, and you really feel like to you get know them. 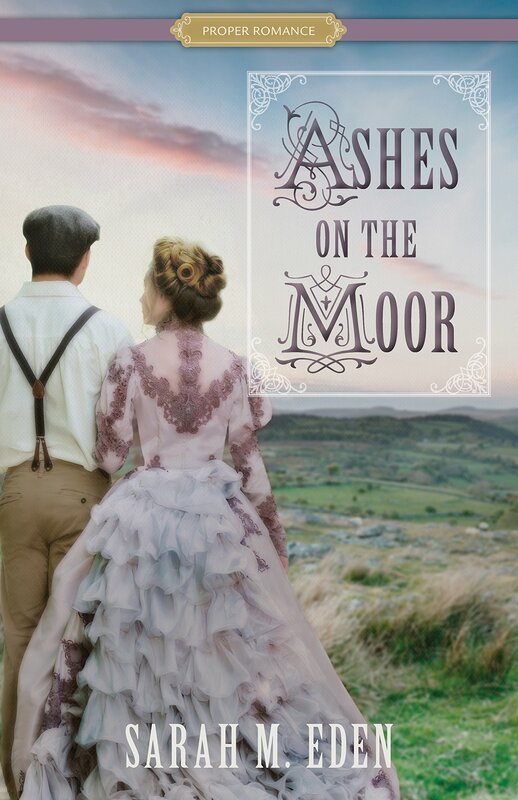 Ashes on the Moor is a great story. The pace wasn't extremely fast, but I did read it quickly (and I bumped a few other books down in my to-read stack when it came because . . . Sarah M. Eden). I can't imagine the pain Evangeline went through losing most of her family, and then being torn from the one immediate family member that she had left. Her aunt and uncle were awful, and being thrust into being a teacher when she'd never worked before would have been so shocking. I really loved how she dove right in and did her best to make everything work. Dermot was a great character as well. He was prickly at first, but he had a lot of depth and goodness once we got to know him. I'm looking forward to reading this again, and would definitely recommend it. I was super excited about this book because of the author. I love her books! But I was also worried about starting this book because it wasn't her typical regency novels, and well, I just devour those. I shouldn't have worried. Eden did it again. I was hooked from the first page until the last. As a matter of fact, as soon as I finished it I had to fight myself to not pick it up and start reading it again. Dermot is the best. I loved his attitude (although it confused me why he was taking everything so personally when he first meets Evangeline...she was trying to be nice). I loved seeing his love for those he cares about. I loved his accent (in my head anyway). I loved his softening and his character. I loved the children in this story, and the families you get to know just a little bit. I understood their hesitations and their gumption. It was fun to get to know each of them. Evangeline is wonderful. Even though she is ill prepared for what life now had to offer her, she figures out a way to make things work. We could all probably take a lesson from her with that attitude. I love how she sticks up for what she believes. I will definitely read this one again and tell all my book reading friends about it.